The theme of International Youth Day 2017 (IYD) is “Youth Building Peace”. Since the adoption of Security Council Resolution 2250 in 2015, there is growing recognition that as agents of change, young people are critical actors in conflict prevention and sustaining peace. International Youth Day 2017 is dedicated to celebrating young people’s contributions to conflict prevention and transformation as well as inclusion, social justice, and sustainable peace. The current generation of youth are the largest in history and young people often comprise the majority in countries marked by armed conflict or unrest, therefore considering the needs and aspirations of youth in matters of peace and security is a demographic imperative. Another Security Council Resolution, Resolution 2282 (2016) recognizes that the scale and challenges of sustaining peace requires partnerships between stakeholders, including youth organizations. It also reaffirms the important role youth can play in deterring and resolving conflicts, and are key constituents in ensuring the success of both peacekeeping and peace-building efforts. The 2030 Agenda for Sustainable Development committed to fostering peaceful and inclusive societies and affirmed that “[s]ustainable development cannot be realized without peace and security”. Goal 16 aims to ensure responsive, inclusive, participatory and representative decision-making at all levels. 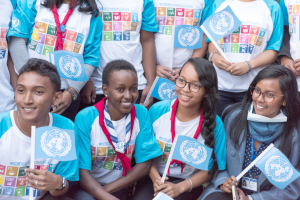 The World Programme of Action for Youth, which provides a policy framework and practical guidelines to improve the situation of young people, also encourages “[p]romoting [the] active involvement of youth in maintaining peace and security”. Young people’s inclusion in the peace and security agenda and in society more broadly, is key to building and sustaining peace. The process of social inclusion for youth, including participation in decision-making as well as access to quality education, health care and basic services promotes their role as active contributors to society and affords young people with opportunities to reach their potential and achieve their goals. When youth are excluded from political, economic and social spheres and processes, it can be a risk factor for violence and violent forms of conflict. Therefore, identifying and addressing the social exclusion of young people is a precondition for sustaining peace. Learn more about the International Youth Day 2017.